Medieval saint, mystic, healer, and visionary-Hildegard von Bingen has made a comeback. She is now popular in natural healing circles, in medieval and women’s studies, and among those interested in investing the everyday with the spiritual. Whether read for the sheer enjoyment of Hildegard’s earthy, intelligent voice (“Let a man who has an overabundance of lust in his loins cook wild lettuce in water and pour it over himself in a sauna“) or for her encyclopedic and often still relevant understanding of natural health, Hildegard’s Healing Plants is a treasure for gardeners, natural healing enthusiasts, and Hildegard fans everywhere. 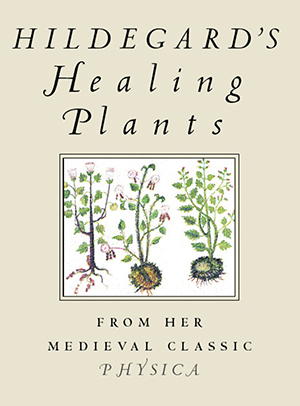 Hildegard’s Healing Plants includes 230 plants and grains-most of which are still grown in home gardens and sold at local health food stores.